Do I walk well on a leash? Depends on how you define ‘well.’ As we strut our stuff, I like to weave back and forth, and dance a little, but my haunches don’t wander far from your legs, ‘cos I like human contact. My name is Tyme. 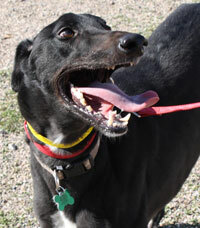 I’m a black male, and one happy affectionate boy that loves to be cuddled and told I’m gorgeous. I’m rather tall, but not too tall for a three-seater couch, or a sumptuous doggie bed. The volunteer this morning told me I was a clean boy because I had not sullied my rugs. I’m not a slob, I told her, and would never do such a thing. I would like to be adopted by a family that views me as the youngest kid and includes me in all the daily fun. With ‘tyme’ on your side, all will be well in your world.